Having finished the last show of the season last Sunday it seems like a good time for a team photo, and an update on how the dogs are doing. Jake is in the back right the photo, at 11 he’s now a bit elderly and retired from all work last summer. Jake seems to have completely recovered from his illness last December, but still suffers with his lower joints on his front legs, stressed no doubt from years of digging mole hills! he now loves living indoors and spends his evenings with both front feet on my leg, looking just as daft as he always did! Mist is next to Jake in the back row, and she too is in her 12th year. She retired from work when she developed diabetes 2 years ago. Diabetes has severely affected her eye sight, but she find her way around and loves her daily walks through the woods. She also loves being the centre of attention and assumes that all visitors to the farm have come just to see her. Sweep is next to Mist second from left in the back row. Sweep is nearly 2 but is still very immature. I’m probably less concerned about his stride length than I was a year ago, I’d say that his bigger problem is that he feels that he needs to do everything yesterday. Every command is taken at breakneck speed, and if it isn’t the instruction that he was expecting, he’s run for a yard in the wrong direction before registering the command and turning to run in the direction required. But if he’s like his mother Fly he may well tkae another 2 years to reach his potential, and he’s certainly a good enough sheepdog to warrant the wait. Alf is on the back row on the left. he’ll be 5 next June, and although he’ll never be as good a sheepdog as his mother Fly, he’s now the master of the ducks for the summer displays and is becoming invaluable for the new Farmyard Shows. He’s very friendly, and nearly as daft as his father Jake, but he has one trick that I’ve not seen before. On a damp morning he’ll pick a downhill part of a field, and while running flat out flip over onto his back and slide 20 or 30 yards on his back!!….. Did I mention that he’s Jake’s son!! 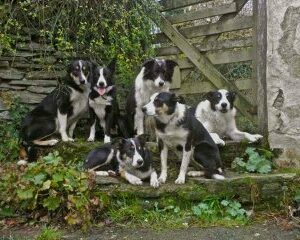 In the front row on the left Zola is now nearly 4. She’s really amazing for her accuracy of work and has been placed in several sheepdog trials in this her first season.. But she still has a tendency to make decisions to over flank when not commanded. It’s only a small fault, but is a part of the intensity of her work, the same intensity that led her to run off the cliff last April. For some jobs she’s my first choice although no all, so it’s still her mother ‘Fly’ who holds the top dog place at Borough Farm. Fly, front right. Fly is definitely still top dog, and I take so much pleasure from working with her, particularly on tough jobs or when the sheep are being difficult. She took 4 years to train, and even now she’s pushy and strong and needs me to concentrate on her fully. If you’ve not seen the video of her in action on one of this summer’s Shepherding walks on the cliffs, have a look to me it encompasses all that is incredible about a working sheepdog, and what makes me so proud of Fly. 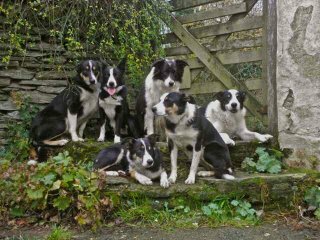 Fern didn’t make the photo she’s now 15 and the oldest sheepdog that I’ve ever owned. She’s very frail now, but still enjoys a walk around the field and sleeps by the farmhouse door during the day. Wyn. Wyn couldn’t sit still for the photo as she’s only 9 months old. She is one of Zola’s pups from last winter, and only started her training at the beginning of September. But since training commenced she has developed amazingly well, and has just about every trait that I’m looking for in a sheepdog. It’s early days yet and I shouldn’t get carried away, the younger dogs are all really good, but if I were to put money on which will one day surpass the abilities of Fly. at the moment I would say that it would be Wyn! Once again Borough Farm was the highlight of the holiday.